On 5 November, sometime in the 1770s, crowds gathered in the Lower and Middle Wards of Windsor Castle to celebrate Guy Fawkes Night. The occasion, presumably an annual one, was captured by influential English watercolourist, Paul Sandby, in a lively composition which features as November’s ‘Image of the month’. The hand-coloured acquatint held in the Archives and Chapter Library [SGC F.160] is full of human interest as it shows people dancing drunkenly round a raging bonfire or engaging in a wide range of other activities, whilst a firework shoots into the sky. At the front right of the picture a pie-man and a man with a goose in a basket attempt to sell their wares, whilst an elderly man is carried by uniformed guards on a chair mounted between two poles. To the left, a young lad loses control of his pony as he rides beside a horse drawn carriage making its way down Chapel Hill. In the centre, a dwarf engages in conversation with a uniformed guard who holds his hand against the sleeve of a protesting woman, presumably to restrain her. In the foreground, two dogs appear to be ripping apart a hat or other item of clothing. The engraving is also of architectural value since it depicts the Round Tower before it was heightened for George IV and shows the old guard room to the east of the Chapel, long since demolished. The guard room, a rectangular late seventeenth-century building, which abutted the east side of the old wall separating the Lower and Middle Wards, had a curious pedimented portico which the picture illustrates. Originally referred to as Gunpowder Treason Day, the annual celebration now known as Guy Fawkes Night or Bonfire Night, commemorates the safe deliverance of King James I from an assassination attempt known as the Gunpowder Plot. The story is well known. On 5 November 1605 Guy Fawkes, a member of a Roman Catholic conspiracy against the Protestant King, was caught guarding a hoard of explosives placed beneath the House of Lords, and was arrested. 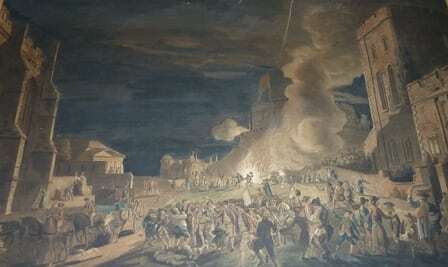 Bonfires were lit around London to celebrate King James I’s deliverance from the assassination attempt, and several months later, in January 1605/6, the government introduced The Observance of 5th November Act, also known as The Thanksgiving Act, which enforced an annual public day of thanksgiving for the plot’s failure. The Act was not repealed until 1859. The artist, Paul Sandby (1731-1809), was an English map-maker who turned his skills to watercolour landscape painting. In 1768, he and his older brother, Thomas, became founding members of the Royal Academy in London. Paul spent a considerable amount of time in Windsor, sharing a house in the Great Park with Thomas, who had been appointed Deputy Ranger of the Royal Park at Windsor by the Duke of Cumberland. During the second half of the eighteenth century, Paul and Thomas Sandby produced many views of Windsor Castle and its environs: the picture featured being one of series of four prints of Windsor Castle published in September 1776. 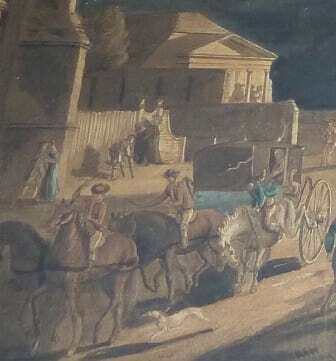 Over five hundred of their watercolours and drawings are now held by the Royal Collection Trust at Windsor and a number of them have been reproduced in book edited by Lady Jane Roberts, Views of Windsor: Watercolours by Thomas and Paul Sandby, published in 1995 to accompany an exhibition of their work.